Before I engage students in any unit of study, I begin by surrounding students with what it is they will be studying. I place books of the genre being explored in book baskets, on shelves, and I pepper them through our daily read alouds. Students slowly begin to get a feel for the style. After a week of this silent introduction, I begin to ask the students what they’ve noticed about these new books. As the conversations are just emerging, a few brave writers dabble in writing in the new genre. These early steps are where I begin my search for student-written mentor texts. As students take these risks in writing, I ask them to share with the class. I publicly celebrate the bravery of trying something new; I ask the writer to talk about how they felt writing the piece, and I tuck these conversations into my notes and keep it in the front of my mind. These interactions are the early steps in creating a student-written mentor text. As we move forward in our study, we continue to explore the genre. We read for enjoyment, we read for understanding, and later we read as writers, looking to imitate the style. We chart our discoveries and our questions. While I still have not asked students to write, more and more begin to explore writing in this genre. As I notice more writing within our community, we share and discuss the experiences and ask questions. I listen carefully for the pieces of the conversations that connect. Carefully, and purposefully, I point out these connections between writers and encourage more discussions to connect the similarities. Building familiarity with the text helps to cement the piece as a mentor. Once I have a selection of student-written texts, I comb through the pages in search of pieces to serve as mentor texts. I begin by considering the needs of the students. I look for patterns in writing. I look for pieces to bridge a student’s current writing to the genre. I look for pieces that will highlight structure, craft, word choice, conventions or any other instructional need. I look and listen for writing that was favored by the class. All along, I am asking myself, how can I help the writer. I move forward to engage and support writers, not the writing. Great spacing and look at all those lower case letters! Using student-written mentor texts has elevated the confidence of all writers in our classroom. These mentor texts allow students to work within their proximal zone of development. Students study work that is within their reach and they learn to believe in themselves as writers and mentors. When students see their writing guiding other writers, they feel worthy, valued, and they are empowered. The writing of a peer isn’t polished and flawless like the purchased texts we share in our classrooms. Instead, it’s a piece of writing created by a friend; we can speak with the author to get advice and discuss the work. Two examples of student-written mentor text from our classroom. Dialogue and connected events. Details and connected events. Click here to visit the left or right student-written mentor text. I like the convenience of having student-written mentor texts in digital form. Whether the students have written digitally, or on paper, I place the mentor texts in Evernote, Educreations, or KidBlog. Digital storage and organization keeps the texts at my fingertips for conferences, minilessons, and parent meetings. Another advantage of digital tools is the recording of student’s voice as the author reads their story. Students also have the ability to revisit the texts when they’re looking for support, ideas, or examples. Student-written mentor texts have changed my instruction, our workshop, and who we are as writers. one, by Sunday, May 8th at 11:59 p.m. EDT. Beth Moore will use a random number generator to pick the winners, whose names she will announce in our blog series’ IN CASE YOU MISSED IT POST on Monday, May 9th. I am a new teacher and I learned that starting with knowing what your students have is essential in teaching writing. I would love to hear more about how you use student-written mentor texts step by step! Student mentor texts are one of the most powerful tools in writing. I have gathered many memoir mentor texts that students have mined for powerful craft moves. Such an important reminder to make sure we are using mentor texts that are “within reach” for our students. What better way to do this than by using student writing. I am trying hard to remember this each day-to be on the lookout. Thank you for this wonderful post! This post is so great since it takes all of the thinking of done about student-written mentor texts and takes it a step further by organizing them (and including students’ voices while reading them). Very, very cool, Deb! This is very interesting! So if I understand your explanation above, you have the students record themselves reading the passage using websites/apps such as Evernote, Educreations, or KidBlog?? Is it easy to use and save?? Are you capturing the audio/video using your phone or ipad? Sorry for all the questions, but I normally scan my students’ writing pieces to use during mini-lessons and I found this so much more powerful that I can’t wait to try it! Thank you so much for sharing!! We are working a lot with writing continuum in one of my schools and I think Craft Moves: Lesson Sets for Teaching Writing with Mentor Texts would really support this work. Love this post. I have witnessed, first-hand, the power of using our own students as mentor authors. Thank you for sharing this great idea of using student-written mentor texts. Ack- I know I have to get better at using student written mentor texts! Thanks for the tips! Organizing student mentor texts is on my list. Adding in their own reading of the text will be a bonus. Thanks for the tips! Thanks so much for this posting, especially about using student work as mentor texts. It is so powerful and such a delight to see the pride in child whose work you are using as the mentor. What it does for confidence as a writer and engagement! Lisa Eickholdt’s book ‘Learning from Classmates’ is a must-have for any teacher interested in learning more about using student work as mentor texts! Loving this blog series! Student mentor texts are so powerful! This post talks to the heart of where I am as a teacher of writing. Although I spend the Writing block in 5th grade, I too try to front load the genre in which students will be asked to write by focusing interactive read alouds in that genre. Then, we begin an anchor chart with our noticing about that genre: What is sometimes true of books in that genre? What always seems true? Then, as a learning community, we write a definition for that genre. I think that constructivist learning is so much more powerful than the traditional method of giving them the definition. Students are asked sometimes to choose a book in that genre for independent reading time, and guided reading books also support that genre. Very powerful. We have been collecting student work as mentor text for a couple of years now. We use the copier to scan the documents (in color) and create a PDF. Then, we compile the collection on Google docs to share with all teachers of all grades. It is really fun to have a 1st grade piece used in a 4th grade room to show dialogue or Pop OUT words or “getting a character in trouble”. I love the idea of putting the child’s voice reading the piece with it!! I am a big fan of using student writing as mentor text! One of the many advantages of student mentor text is that student’s self-esteem is lifted. As you wrote, “When students see their writing guiding other writers, they feel worthy, valued, and they are empowered. The writing of a peer isn’t polished and flawless like the purchased texts we share in our classrooms. Instead, it’s a piece of writing created by a friend; we can speak with the author to get advice and discuss the work.” This is one of the main reasons we need to use more of these kinds of mentor texts in our classrooms. I also love the idea of saving kids’ writing digitally and having the author read their piece. Brilliant! Thanks for the great ideas. As a literacy coach, I am always looking for new ideas and would like to have my staff do more with mentor texts. I really like the idea of silently introducing the genres to the students by letting them explore the texts and by using read-alouds. I love the way you expose your students to the new text over time. Looking forward to seeing Stacey’s book. Thanks, Elsie. It’ll be published in early June. I appreciate the reminder about looking for gems – even in the crumpled up pieces of writing! I love these posts on using mentor texts! Thanks! This is an area I need to work on and your posts have been very helpful. Thanks for writing the mentor text series. This is an area that I want to develop and include more of in my writing instruction. Always looking for ideas. We added ‘The Fridge’ to a wall in our room this year. This is where we put up student written mentor texts from all content areas. I have just started to collect a good sampling but already my students are drawn to ‘The Fridge’ to see what they can try with their 5th grade expertise. I have always loved using mentor texts written by former students with my present class. I believe sharing “kids’ writing” provides a special kind of motivation for students as they work on their own pieces. Thanks for another great post! “These mentor texts allow students to work within their proximal zone of development.” This is so true, especially for ENL students. I also found using student mentor texts to work extremely well with writers at the Development stage in Freshman Composition at college. They are extremely curious about what their peers have written and eager to improve their own writing knowing their classmates will be reading/hearing their writing. Thanks for a lovely post. My book won’t cover student-written mentor texts (picture books-only in mine). However, if you want more on student-written mentor texts you should check out Lisa Eickholdt’s book. It is fantastic! Thanks for the shout out, Stacey! Immersing the students in mentor texts is such a great (yet most times forgotten) way to raise the level of student writing! This is very useful information as I work with teachers of writing! Thank you for sharing your thoughts! We’ve had some amazing experiences at our school using student mentor texts. Recently, a third grade poet inspired many of his classmates. His poem, written from the point of view of a candle on a table at a restaurant, triggered other writers to take the point of view of an object. He repeated several verbs in his poem and his peers did the same after seeing how he did it. So powerful. And best of all, he felt like a total rock star! Can’t wait to read Stacey’s book! I teach special education and so thank you for your thoughts about honoring all writing. Often beautiful ideas and unique perspectives can be overlooked due to poor spelling and punctuation. I need use more student mentor text in my teaching to inspire and empower. Love this! When students “see” themselves as writers it can be so motivating for ALL writers. There is (as you said) a gem in ALL writer’s work and for all student writers to see that is so very important. This is such wonderful advice. We sometimes overlook the value in a student’s work that isn’t picture perfect. “All writers have value” – that would make a good mantra. I am a literacy coach and this post is going to be the next topic of discussion with the k-2 teachers that I work with. I love the idea of immersing writers in the genre prior to launching the unit and then celebrating the writers as they try on the new genre in their own writing. I think when we use a variety of mentor texts ( published, student pieces, teacher pieces and shared writing pieces) it promotes the idea that we are all writers and we can learn from each other! Thank you !!!! Such a powerful tool! Do you only point out positives on student work? Or do you discuss suggestions too? Thanks for sharing! Thank you for reading and commenting on my post. For the most part, I use the student-written text for modeling work I hope the students will emulate. On occasion, if I have a piece from a previous year and I can keep the author anonymous I will use a bit to help kids see how to revise work. Each year as we wrap up our poetry unit, my students choose their best work. I make copies and put their poems together in a little book and each student gets a copy to take home. I am always blown away by what five and six year olds can write when they “get” poetry, and the little books are pretty wonderful. These collections of student work also provide a terrific source of mentor texts to my current class. I can find many examples to illustrate any technique I’m teaching at the moment. My current kids love pouring over the books, too. I don’t know how I’d teach poetry without them now. Thanks again for sharing! Do you have examples of this at the middle school level of writing or suggestions? I am sorry Marie, I am a primary teacher to the core, I do not have any secondary pieces. I would suggest sorting through the writing of your current students, or even asking your peers to join you. You will be amazed at what you will uncover! I too have found that using student writing as mentor texts to be just what some students need to move forward in their own writing. Love the recurring theme of silently immersing students in the genre before looking at the text with writer’s eyes. I agree that the use of student-created mentor texts is a powerful tool for teaching. I often use a student’s kidblog post to celebrate the writing and to collectively edit so we can all see how to create paragraphs or place commas. 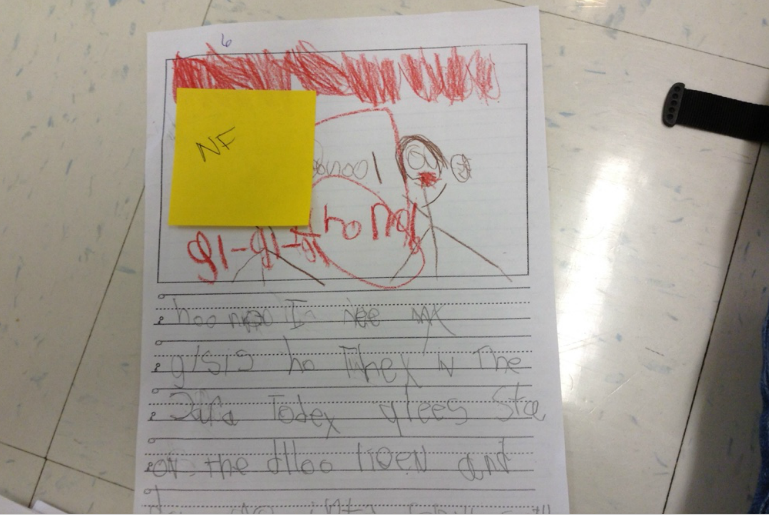 Students thrive when they can see their own writing in a new way. I love the tips about organizing student-written mentor texts! I will check out these digital resources and would love to record the students reading their piece. Thank you for your comment. I have also found Lisa’s book a great tool! I am remiss to not have mentioned in the post. I would love to see some of your students mentor text. Maybe we could exchange a few and add variety to our collection. Adding student voice really adds so much. I am so pleased with the way digital tools lift the level of learning, engagement, and teaching. Thanks for reading and commenting. Thank you for walking through the building blocks of establishing your writing community, Deb. I have also found the power of using student-written mentors to help my writers advance their skills. One of the resources I relied heavily on this year was Lisa Eickholdt’s book, Learning From Classmates: Using Students’ Writing as Mentor Texts. As you have described, I have discovered tremendous benefits for my young writers in being on the lookout for student examples of what our writers can work toward. These examples provide different opportunities than professionally written texts, amplifying the craft moves in a way that says, “I can do this.” Valuing each writer’s writing is so important to creating a safe and creative community. Thank you for sharing your thinking on this. I will be sharing this post with colleagues! I appreciate the idea saving student mentor texts in digital form. Thank you for sharing. Thanks for sharing some great ideas for finding and using student-written mentor texts!